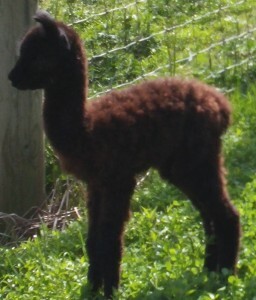 Our first spring cria was born on May 17. 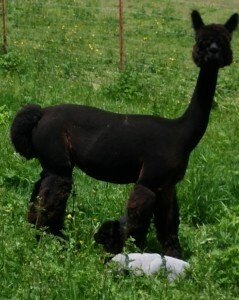 Peaceful Heart’s Black Ice was born to our lovely, first time mom May and beautiful black herdsire Maximus. Despite a very cold and difficult beginning, Black Ice is growing well and quite active. He is a gorgeous black, just like both his parents (whose fiber is featured in one of our handwoven shawls). 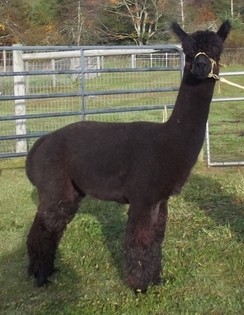 May is the darkest daughter of our fabulous, longtime herdsire Powergrid. Maximus is one of our wonderful new Champion herdsires. His first three crias were born on the farm last year, and they are incredibly consistent in dense, soft fleece, and cute, full fleeced heads (with fuzzy ears). You can read more about Black Ice’s rough start and our efforts to save him in our previous post Black Ice is now running around our front pasture near the store, awaiting the birth of some playmates. We hope you can stop by and see him soon.